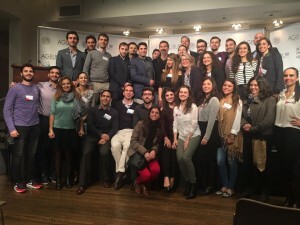 Armenian Young Professionals from around the world attended the celebration of the 110th anniversary of AGBU, and the organization’s 89th General Assembly. Musician and activist Serj Tankian headed a human rights symposium with News Deeply-founder Lara Setrakian, and afterwards posed for a picture with YPs in attendance. YP attendees represented 18 cities in 13 cities: Los Angeles, San Francisco/Bay Area, Sao Paolo, Buenos Aires, Marseille, Frankfurt, Athens, Geneva, Boston, New York City, Istanbul, London, Houston, Brussels, Lyon, Amsterdam, Toronto and Beirut.